Geriatric patient with coronary artery disease (CAD). 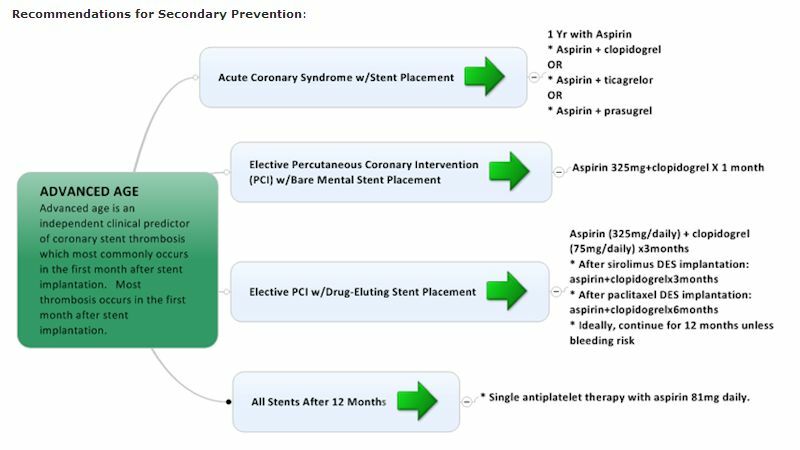 Provide antiplatelet therapy recommendations in CAD patients with/without coronary stents. Age is an important determinant of outcome in patients with coronary artery disease. Antiplatelet therapy has been shown to improve outcomes, however, antiplatelet agents are prescribed less in the advanced age group due to limited trial data guiding care and uncertainty about benefit/risk, complex health status, and medication interactions. Platelet plug formation: The process starts when the platelets are in contact with a damaged vascular wall exposing collagen fibers. The platelet body is transformed (edema, irradiating pseudopods, and its wall becomes sticky). The platelet contracts releasing granules with activating factors (actin, myosin, thrombosthenin, prostaglandins, calcium). The activated platelet is adhered to collagen and to Von Willebrand factor and releases large amounts of adenosine biphosphate (ADP) and thromboxane A2, which activates new platelets. 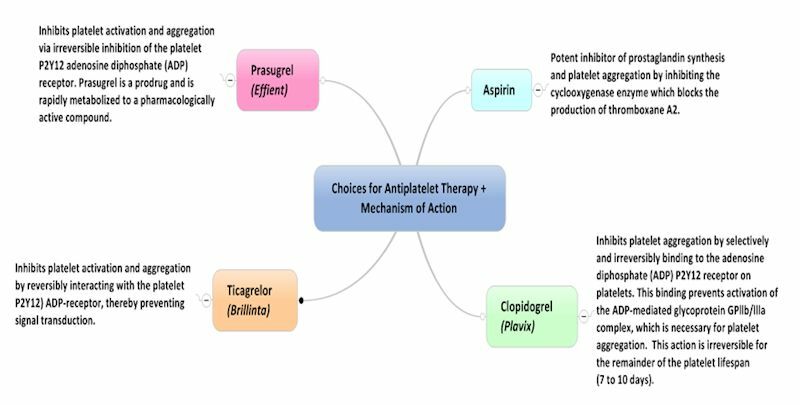 List the choices for antiplatelet therapy and their mechanism of action. List current recommendations regarding type and duration of antiplatelet therapy in patients with/without coronary stents. Users are free to download and distribute Geriatric Fast Facts for informational, educational, and research purposes only. Citation: Guru Krishnan, Kathryn Denson MD, Gabriel Manzi MD, Diane Brown, Fast Fact #23: Antiplatelet Therapy in Coronary Disease, February, 2013.